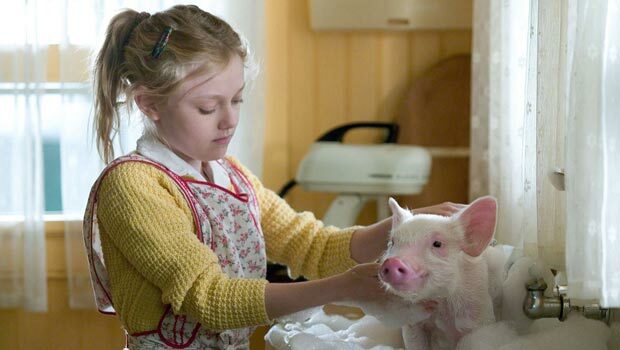 Summary: Charlotte’s Web is simply terrific family entertainment and a worthy cinematic adaptation of the classic book. Wilbur (Kay) is a runt. His mother cannot feed the whole litter, so his life expectancy is short until Fern (Fanning) begs for his life and promises to bring him up. Fern and Wilbur form a very special bond, with Fern hand-feeding him, wheeling him about in a pram, sleeping with him and generally treating him like a cute porcine doll. However, as Wilbur grows, its clear that he can no longer live in the house like a pet and he is moved over the road to Fern’s uncle’s farm. Wilbur misses Fern, though she visits every day after school. The other animals are quite standoffish and Wilbur has no one to play with until he meets Charlotte (Roberts), the spider who lives in the rafters. The two outsiders form a bond that is tested when the other animals reveal that Wilbur’s days are numbered; if a miracle is what is needed, then Charlotte will provide one. She spins words into her web to convince Zuckerman that Wilbur is no ordinary pig and worth saving. Based on the beloved novel by E.B. White, it seems surprising that, after Babe, its taken so long for a live action version of Charlotte’s Web to come to the screen. It employs the same technology as Babe, with a mixture of real, animatronic, and CG animals, coupled with a fantastic array of vocal talent, to bring the barn to life. Among the stars: Steve Buscemi as Templeton the rat, Oprah Winfey and Cedric the Entertainer as Gussy and Golly the geese, John Cleese as Samuel, leader of the sheep, Robert Redford (!) as Ike the horse, Kathy Bates and Reba McEntire as Bitsy and Betsy the cows and Thomas Hayden Church and Andre Benjamin as new characters, the crows Brooks and Elwyn. The sterling voice cast aquit themselves admirably and the effects are seamless, so that after the first five minutes there doesn’t seem to be anything strange about talking animals. (This may seem obvious to younger viewers, but I remember only too well the hideous disappointment that was the BBC’s animatronic Aslan, and that wasn’t that long ago. )The characterisation of the animals is very funny; with so many species sharing the barn they bicker constantly, pick on Templeton, tease Wilbur. But the heart of the story is the relationship between Wilbur and Charlotte, and their deep and abiding loyalty. Spiders are potentially creepy, which the film acknowledges by making Ike arachnophobic, and Roberts’ warm tones really help to bring Charlotte to life. She has also been anthropomorphised, and is actually very pretty. There are some beautiful cinematic moments – Charlotte’s web-making is just lovely – as is a long tracking shot where the camera follows Templeton into his lair, and the opening transition from animated title sequence to libve action is also very well handled. The story is really very similar to Babe, in that in both the young pig has to find a way of proving that he alone of his kind is special. Babe succeeded by having nice manners; Wilbur through the power of friendship (and by being, in turn, ‘some pig’, ‘terrific’, ‘radiant’ and finally, brilliantly, ‘humble’ – good lessons for us all). Charlotte’s Web is simply terrific family entertainment and a worthy cinematic adaptation of the classic book. If it doesn’t bring a tear to your eye… check your pulse.